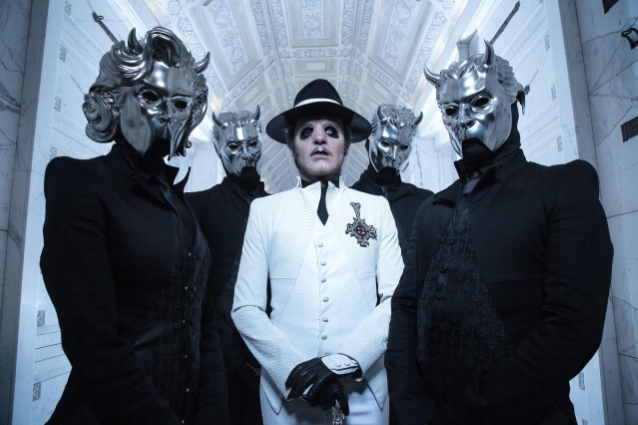 Tobias Forge has confirmed that GHOST is planning to film a concert DVD and Blu-ray during the band's still-ongoing world tour in support of last year's "Prequelle" album. "That's definitely in the pipeline," he told Australia's Wall Of Sound in a new interview. "We don't know yet as to when and where we will shoot this. It really, really isn't something that you do just anywhere. You wanna do it in a venue that might possess some sort of look, some sort of aura." The GHOST mastermind continued: "I think for what I wanna do and how I like things, and being a control freak and a very much habitual person, playing arenas is the best thing in the world, because nothing changes. The production is more or less the same every day. But as an individual who was kind of rebellious in the aesthetic, the downside — if there is one negative thing to say — is it's very repetitive and very generic. So, most venues, even if it's a very well-known historical arena or a newly built one, they basically look the same. So, from a cinematic point of view, there are slim pickings when it comes to a suitable venue. So we're trying to look into that — if there's anything historical, as in an older venue. Also where we can play. Where can we do the production? Maybe in Europe. Maybe an old Roman arena or something like that. That would be more of a physical look. And on the other hand, in order to do things like that, you might need access for more than one day. And it would be really good if the place was sold out. It would be really cool if that crowd was a very vivid, raging, Friday-night sort of crowd instead of a very subdued, Tuesday-night, wants to leave during the encore… even if it's your crowd. There's a very big difference between the two extremes. You can do fantastic shows in the middle of nowhere, or even in a big metropolitan city, on a Tuesday night, and the crowd equals dancing with someone that is about to fall asleep." Forge performed as a "new" Papa Emeritus on each of the band's first three LPs, with each version of Papa replacing the one that came before it. Papa Emeritus III was retired in favor of Cardinal Copia before the release of "Prequelle".